Though armed only with a light shield and a bamboo spear, the Hindus Pattisainya are well suited to combat in a number of regions, and are incredibly useful auxiliaries. All across the lands of the East the tribes of the Hindus have spread themselves, teaming across a region larger even then the empire of the conqueror Alexandros himself. Despite their far-flung habitation, the practice of war was much the same among most of them. These Hindus Pattisainya are a fine brigade of lightly armed spearmen drawn from a number of tribes like the Gandharas and those that the Hellenes called the Aspasios, or even the Yaudheya beyond the Hindus itself. Their tribal differences occassionally spring up, but by and large they are united by their common religion - mostly some form of Buddhism, but often enough they can find accomodations with their own local or shared gods. Though armed only with a light shield and a bamboo spear, they are well suited to combat in a number of regions, and are incredibly useful auxiliaries. Historically, the infantry employed by Hindus kings like Ambhi, the two Purushotthama kings of Kekeya (the two Paurava kings), or even the far off dynasts of the Audumbaras and Yaudheyas, was dominated by light armed levies like these. Particularly among the former peoples in Gandhara and farther North among the Southern Kambojas, where class restrictions on warfare were more relaxed, and peasant levies more prevelant. They fought valiantly for their kings when men like Megas Alexandros brought his campaign to the banks of the Hindus, and even more so in their own ancient epics of battle and spiritual awakening. Later on, they fought for Alexandros himself in contingents provided by his vassals, and at various times in the armies of Indo-Greek kings like Menandros and Antialkidas. In these later times, they were a huge and formidable component of Indo-Hellenic armies, but had more restricted or varied origins. 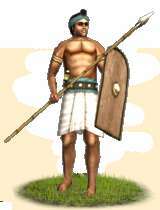 Under Menandros, they were probably heavily drawn from the Madras, Sibis, Kekeyas, and other Gandhara peoples - though local levies from among the Yaudheyas, Audumbaras, and other Buddhist peoples of his massive empire - while the armies of Zoilos or Lysias probably included more peoples of the West-Central Hindus region. Later, under the Saka, they probably served mostly as light garrison or support troops for their countrymen in the archer corps or the King's Hellenic infantry.